Palitana, in Gujarat, has emerged as one of the fastest growing real estate hubs in India. The value of property in Palitana has shown a steady rise in the last decade, primarily due to a multiplicity of development projects in the area. The infrastructure of the area has undergone a revolution, thanks to improvements in the roadways, transportation system, availability of amenities, and security facilities. Families moving to the apartments in the region enjoy good connectivity to all the important areas around. Road and rail transportation is well developed in Palitana. 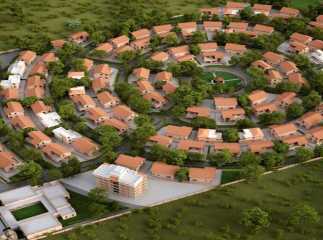 Evidently, the projects in Palitana are ideal for homeowners to invest in, considering the optimal location. People looking to invest in property in the region for commercial purposes, too, should buy the apartments now. If you are looking forward to investing in the plots in Palitana, have a look at the tremendous benefits in terms of transportation and connectivity here. The airport at Bhavnagar is 51 km away from the residential estates, which you can reach within one hour. The international airport at Ahmedabad is 251 km from the region, and you can avail roadways and railways to reach the same. Religious and tourism-travel is also well developed in the region. Keeping these prospects in mind, the state government has initiated a plan to develop an airport for Palitana. Commuters will face no hurdles in travelling to the commercial areas as Palitana has got a railway station, which connects it to Bhavnagar and Songarh. Apart from this, people living in the villas in Palitana can seek bus transportation facilities too. The buses run from Palitana to other important places like Una, Diu, Talaja, and Ahmedabad. The bus stand is located within 1 km from the Palitana Railway Station. Besides, taxis are also available for quick transportation. A number of schools and hospitals are located in close proximity to Palitana. If you move to one of the apartments in Palitana, you can enjoy quick connectivity to any of these. The important schools in the region include Delhi Public School, The New Tulip International School, Satyameva Jayate International School, Shanti Juniors School, and St. Ann’s School. Important hospitals close to the residential area are Sai Nath Hospitals, Krishna Shalby Hospital, Life Care Hospital, Bhopal Multi-Speciality Hospital Speed Trauma & Emergency Centre, and Nisha Women's Hospital and IVF Centre. Well, home-lovers would definitely love to invest in the property in Palitana Ahmedabad. The complexes are under CCTV coverage with adequate security facilities. The apartments are spacious and well-circulated. The interior spaces are elegant with large windows and wide balconies. Besides, you will come across various fitness and entertainment amenities within the complex. These include gym, swimming pool, meditation hall, jogging tracks and green zones. The 1/2/3 BHK apartments are available at prices which are affordable for the high-end and mid-range buyers. In case you are interested in the properties in Palitana, you can book an apartment for yourself now. Enjoy a classy lifestyle amid the greenery, while remaining close enough to the city. Get across to an upcoming residential estate with all the amenities you need.